The Azerbaijani army has established full dominance on the line of contact, President and Supreme Commander-in-Chief Ilham Aliyev said when he was at a military unit in Agdam. 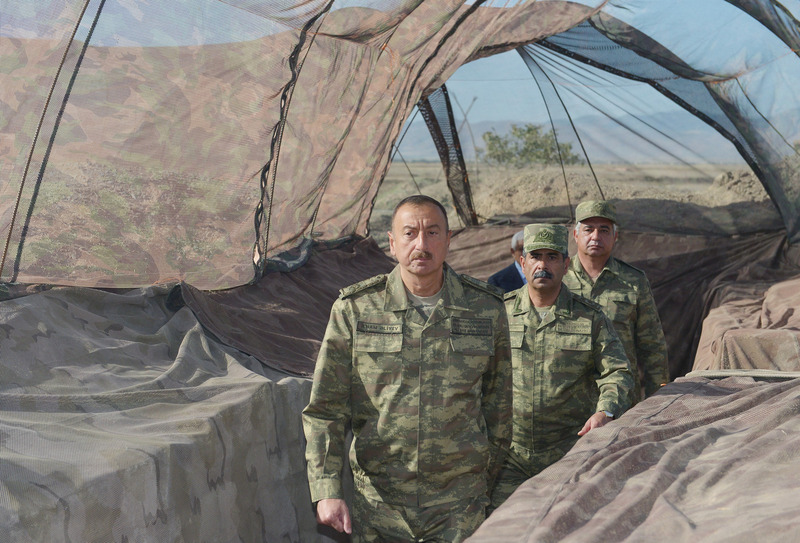 President Aliyev visited the Agdam region located near the contact line of Armenian-Azerbaijani troops, following the recent fighting on the frontline, on August 6, the presidential press service reports. "The situation is fully under control. Our positions are durable and strong," the president said. "The professionalism and combat capability of the Azerbaijani army are growing. Azerbaijani soldiers, non-commissioned officers and officers adequately serve the motherland and remain loyal to their home country. All our military units, especially those located on the front line, are in high spirits. A sense of patriotism among Azerbaijani soldiers is very high and strong. We will continue to build up our military capabilities. Currently, the material and technical infrastructure of the Azerbaijani army is at the highest level. The weaponry and ammunition we have acquired in recent years suggest that we can accomplish any task." President Aliyev reminded that Azerbaijan has been producing modern weaponry and equipment. "At the same time, the equipment, machinery, weapons and ammunition we purchase from foreign sources also meet the highest standards. The most advanced air defense installations have been acquired. Our army has the most powerful artillery. High-precision missile systems with a great destructive power, combat and transport helicopters, combat aircraft, armored vehicles, tanks - all of these are factors that form the potential of the Azerbaijani army today. Today, the Azerbaijani army is capable of destroying any object in Nagorno-Karabakh. This is known to us and the people of Azerbaijan, and this also be known to the enemy. Today, stability in the region is provided only thanks to the policy of the Azerbaijani state. Azerbaijan is a stabilizing country. Today, by increasing our capabilities, we have an even stronger army which is capable of fulfilling any task at any time." Speaking of the events of the last few days, President Aliyev said the enemy is in a state of panic and hysteria. "A week ago, the enemy, the Armenian occupying forces, attacked our positions in a cowardly and villainous manner, under the cover of darkness. We have suffered losses, our soldiers became martyrs. May God bless the souls of all the martyrs and grant patience to their families and friends! But at the same time, the enemy got an adequate answer. As always, the Armenian side is concealing its losses. However, we know that dozens of occupants were destroyed. The soldiers, warrant officers and officers who have shown special courage, bravery and professionalism in the course of these operations are seated around this table today. I have rewarded them. On behalf of the Azerbaijani people I want to express my gratitude for the courage and professionalism displayed. I am confident that you will continue to adequately implement all combat missions. "We have sufficient opportunities to know what is happening on the other side. We have completely taken over military and moral advantage. We are on our own land. The martyrs killed a week ago died on their land. The question is: what were the Armenian soldiers, the soldiers of occupying forces, doing on the territory of Agdam? Today, the fascist leadership, the military junta of Armenia is leading the country into an abyss. They have occupied our lands, but at the same time they have occupied the whole of Armenia. The Armenian people should get rid of the criminal and corrupt leadership. Otherwise, huge disasters are in store for Armenia. If the Armenian fascist state does not give up its dirty deeds, the very existence of the Armenian state can be called into question," he said. The Supreme Commander-in-Chief further noted that the Armenian state was founded on historically Azerbaijani lands. He said : "The Erivan khanate, Zangezur, Goycha are all our historical lands. We, the Azerbaijanis, must go back to this land, and we will do that! We must restore our territorial integrity. Nagorno-Karabakh is native Azerbaijani land. This has always been the case, it is the case today and it will be the case tomorrow. As a result of the developments that occurred in the early 1990s, our lands were temporarily occupied. But we will restore our sovereignty. The flag of Azerbaijan will fly in all the occupied territories, including Shusha and Khankandi. This is our goal. We are moving towards this goal and should create an even stronger army to reach it." President Aliyev emphasized that Azerbaijan's economic and political potential is many times greater than that of Armenia. As a result of work done in the field of army building in recent years, Azerbaijan has also obtained military superiority and will gradually increase its capacity. "The settlement of the conflict is possible only within the framework of territorial integrity of our country. Nagorno-Karabakh is Azerbaijan's territory, historical and native Azerbaijani land. International law supports our position. The whole world recognizes Nagorno-Karabakh as a territory of Azerbaijan. We will never tolerate a second far-fetched "Armenian state" on Azerbaijani lands and will restore our territorial integrity either by peaceful or military means. We are ready for both options. The picture observed on the contact during the last week and before that gives grounds to say that we are ready for any scenario. Just as we have beaten the Armenians on the political and economic fronts, we are able to defeat them on the battlefield. We have a powerful military potential. It has been demonstrated at different times. Our military hardware is demonstrated in military exercises and parades. But our biggest strength is the courage and patriotism of our soldiers. Such a great young generation has emerged in Azerbaijan now, expecting an order of the Commander-in-Chief. The recent developments also suggest that. Even non-military people have been expressing their thoughts and desires, and want to volunteer to go in the front line. This makes me very happy and shows that the patriotic spirit is very high in Azerbaijan. The moral advantage is on our side. In Armenia, the recent events have triggered a mass exodus of the population. But even before that 70,000-80,000 people have been annually leaving Armenia forever in recent years. In the last days this exodus has intensified. This means that they are afraid of us and are in panic. They admit that without external assistance they will not be able to preserve the independence of Armenia. They openly admit that they rely on external forces. We rely on our people and on our own strength. We will restore our territorial integrity. We must restore it. The Azerbaijani people love their army, believe in it and rely on it. You have made a great contribution to the development of our army. Of course, the soldiers, non-commissioned officers and officers serving in all our military units are worthy of very high praise. But your operations, the soldiers and officers serving in special units, have special services. Every minute you risk your life and display true heroism. I appreciate that, and I want the people of Azerbaijan also to know that we have excellent fighters and heroes. "Your future activities will be successful. Our cause is just. We live on our own land. This is Azerbaijani land. The city of Agdam, which is a few kilometers away from here, is also Azerbaijani land, just like Khankandi, Shusha and all other occupied territories. The Armenian barbarians and vandals have razed the city of Agdam to the ground. The ruins of the city of Agdam are clearly visible from here. All the buildings except for two have been destroyed. We will restore the city of Agdam. We will restore all of the occupied and destroyed cities. We will return to this land, we live and will live with this idea. Until then, until the conflict is resolved, we will continuously demonstrate our principled position and the advantage on the line of contact will always be on our side." The president further congratulated the soldiers on their heroism. "I often visit military units. I have been to the line of contact in this region and other positions. I want to say again that I am provided with timely information. But I have come here today to stand by you in these trenches, say my word and assure the people of Azerbaijan from here that the Azerbaijani army protects the Azerbaijani state and will achieve its goal. We will restore our territorial integrity," he concluded.